New Delhi, Oct 3 (IANS) After opening India’s maiden Madame Tussauds wax museum here on December 1, Merlin Entertainments, a global visitor attraction operator, plans to bring Legoland Discovery Centre, an indoor attraction for children, an official said. Merlin Entertainments had earlier announced plans for investing 50 million pounds in India over a period of 10 years. “Madame Tussauds wax musuem is the first step towards that investment. At the moment, the entire focus on the wax musuem is making it a huge success and once we see what sort of response we are getting for it, we will surely be opening many more attractions in India. There’s Sea Life aquarium, Legoland Discovery Centre,” Anshul Jain, General Manager and Director, Merlin Entertainments India Pvt Ltd, told IANS here. According to Marcel Kloos, Director, New Openings, Europe and Emerging Markets, Merlin Entertainments, they are yet to finalise the development. “Those who follow Merlin Entertainments, know that when we go into a new market, we first open one attraction and then we see how it goes. We take our learnings and then we spread out. What we would really like to see first is how Madame Tussauds does in India and how consumers take it. “Hopefully, they will love it like people have loved it all across the world and then we can bring some of our other brands to the country,” Kloos told IANS. What about Legoland Discovery Centre then? “Not yet. Actually, to be 100 per cent honest, we haven’t confirmed anything yet. We have got a pocketful of brands, with the Legoland Discovery Centre being very exciting, Sea Life aquarium is a well-known aquariam brands and one of the biggest in the world. It could be one of those, but we haven’t confirmed anything,” Kloos stressed. He also said the company’s first priority for all attractions is the location. “Once we found the site (Regal building) in Connaught Place, we were sure it would be a perfect fit for Madame Tussauds. This is how we approach the other brands as well. Especially for an aquarium, there are technically high requirements in terms of how much weight can a building carry as water is heavy. “We are actively looking for (more) opportunities in India, but we haven’t found them yet,” Kloos said. 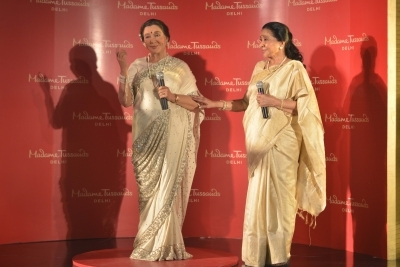 The officials spoke on the sidelines of the launch of legendary singer Asha Bhosle’s wax figure, which will be placed at Madame Tussauds’ Bollywood music zone. The Madame Tussauds wax museum was earlier slated to open in June-July this year. Why the delay? “The delay happened primarily because we were rechecking about the structural stability after the collapse (in a heritage building of Connaught Place) happened. There were also a few delays in obtaining licences from local authorities,” Jain said, assuring that they have the building certified by structural stability companies and agencies, and that the site has been inspected twice already. “It’s a completely safe attraction for kids and adults,” he added. The attraction has opened its online portal booking of tickets with pre-booking offers which include special prices — tickets are open at Rs 860 for adults and Rs 660 for children. After the attraction’s opening, the tickets will be dated, and will be priced at Rs 960 for adults and Rs 760 for children. “The response has been phenomenal… We are expecting good footfalls,” Jain said. “All our wax figures cost around Rs 1.5 crore to Rs 2.5 crore. Each figure takes four to seven months to make, and around 20 artistes work on it. Everything is made in London by a team and then shipped here,” Jain added.